Ms. Armstrong’s practice focuses on coverage and bad faith litigation in both first and third party matters. She has extensive experience evaluating coverage under a variety of insurance policies, including Hull & Machinery, Protection & Indemnity, Commercial liability, Commercial Property, Commercial Auto, Employers Liability, Pollution Liability, Group Personal Excess, Bumbershoot/Umbrella/Excess Liability, and others. She also enjoys providing commercial risk management for her clients. This includes advice on insurance coverage, employment practices, and complex service agreements involving risk shifting through indemnity and additional insured provisions in the Oil & Gas, Construction, and Maritime arenas. Ms. Armstrong has achieved successful results for her clients including directed verdicts on bad faith claims and complete jury verdicts on first party property matters. Ms. Armstrong’s strength lies in her ability to balance the need to dig deep into the details in order to untangle complex coverage issues and the time restrictions inherent to insurance coverage practice. She firmly believes that “getting it right” in a timely fashion matters and ultimately limits her client’s exposure. She also enjoys educating claims professionals and providing seminars for CE credit on varying topics arising under various coverage lines. She received a Bachelor of Arts degree in 2004 from the University of North Texas and a Juris Doctorate in 2008 from South Texas College of Law. She has been recognized by Houstonia Magazine as a 2018 Top Insurance Lawyer. 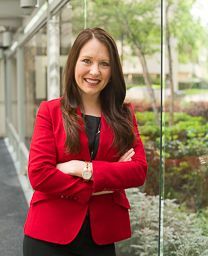 She is a member of the Defense Research Institute, Houston Bar Association, and Houston Young Lawyers Association.